It took me a whole year to remember to buy sugar cubes. Either sugar cubes weren't in the grocery store or I just forgot about it while I was in another store that stocked sugar cubes on its shelves. Mission accomplished? 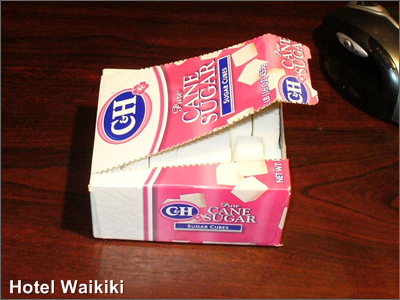 Anyways, the ants got into the box of sugar cubes even before I opened it. Mind you, the inspiration behind buying sugar cubes was not, I repeat, was not, to feed the household ants. Though the ants might disagree. Chocolate coated ants, to that. Sugar feed chocolate coated ants. I've started decorating my blog's banner with Xmas decoration extremely early this year (see above). Still working on blending the Xmas graphic into the pic that I use for the blog's banner. You'll notice the incremental blending makes the banner pic look better each new day. Are "ants" and premature "Xmas decorating" have anything to do with the tea in China? Yes, it does. It's been my experience from time to time while on a few other blogs to notice that the authors have developed an illusion that inhabitants of the world wide web visit their illustrious blogs to live life vacariously through the life of the bloggers as posted on the Internet. I'm not imagining this attitude. I'm so sure that I'm not. On that note, if you, yourself, happen to live life vicariously through what's written on HOTEL WAIKIKI (this blog), you have better get your brain examined, and in that regard, time is of essence. For example, ants and Xmas decorating is your idea of zest for life? Just a kindly reminder. Oddly enough, last night over dinner my husband suddenly said out of the blue..."In 3 months xmas will have already come and gone." I'm already looking forward to 2011. Love those decorations, but I think you also need a Jack-o-lantern up there to really do it right. Rowena- I think the syndrome exist because last year stores started putting out the Xmas decor so darn early. At least it seemed that way to me. Old what's his name there- I'll finish the decoration by Xmas. I might throw in a few kruggerands. Keep the sugar in a ziploc bag and place in your cupboard. This will keep the ants out. gigi- too much trouble for me to do that. Kay- there's a thin line where one party thinks that they're doing the other party a favor by reading a given blog, and visa versa, the blogger thinking they're doing the reader a favor. I've always felt it should be a mutual acquaintance. Cloudia- He rather be sailing. Well, up until the yacht docks at its slip and it's wash the boat time. Where everybody went? Hmmmmm. Nate- ....and 7-11 has flavored liquid cream packets.